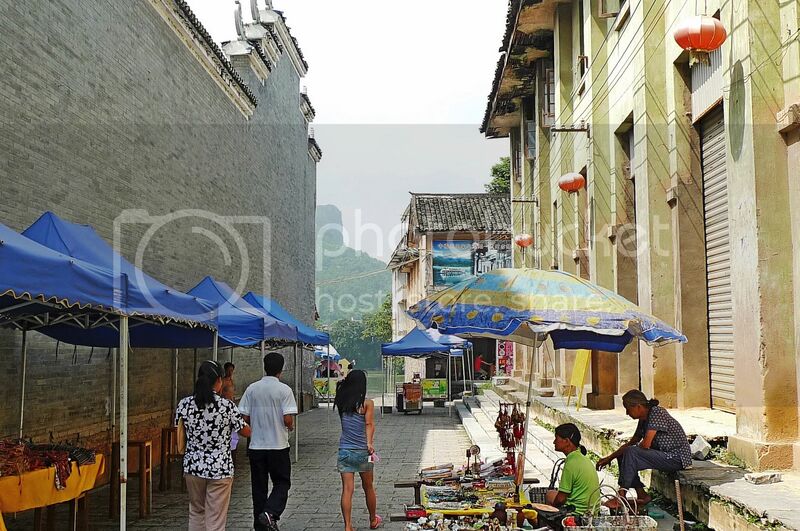 On our 2nd day in Guilin, Jam, his friend and I visited Daxu Ancient Town (大圩古镇) which is located about 15km southwest of Guilin city on the eastern bank of Li River. 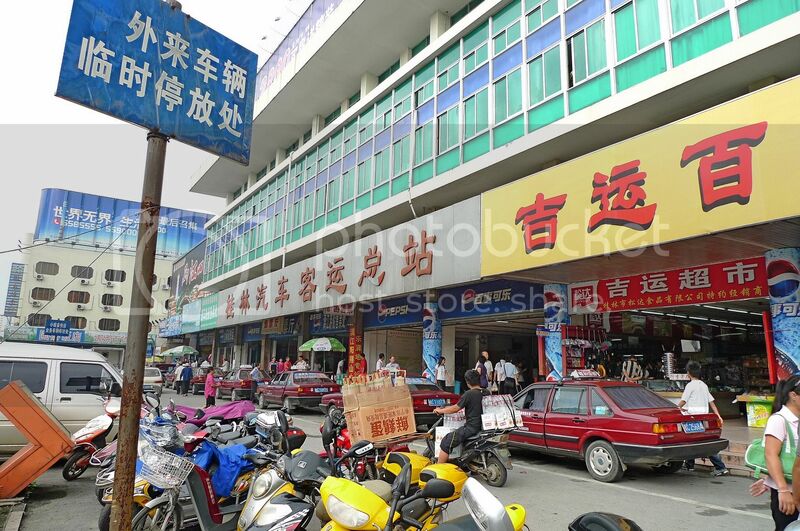 We reached the Guilin Bus Terminal at about 9.30am to board a bus to Daxu. Here we were approached by a local guide who tried to convince us that there was nothing much to see in Daxu and recommended other destinations instead. As I was not fluent in Mandarin, I let Jam did all the talking. Luckily, he was adamant about going to Daxu and was not influenced by the guide. 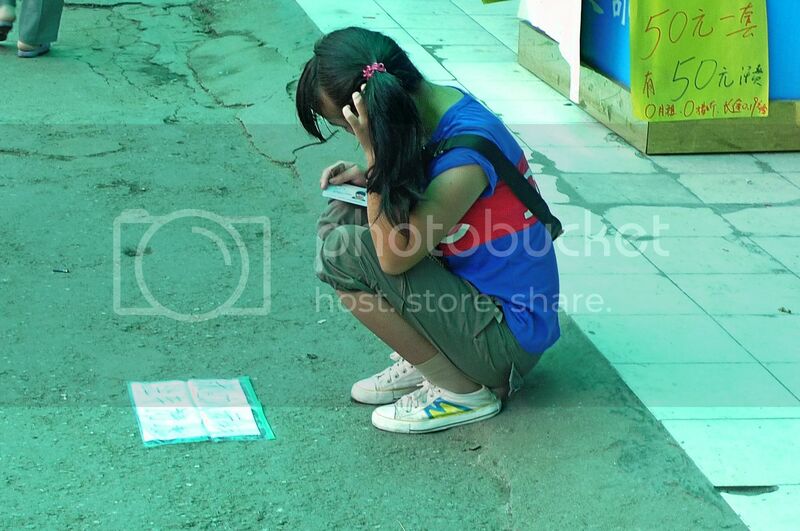 While walking towards our bus, we came across this young lady squatting at the sidewalk. 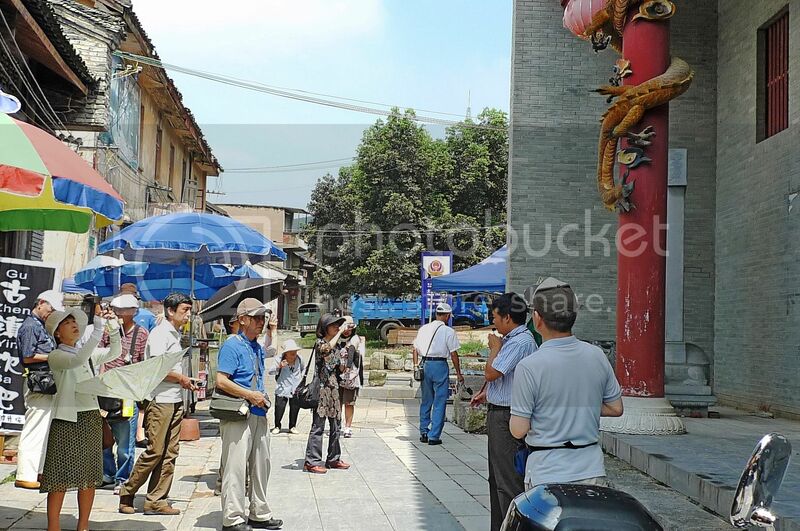 There were writings on the paper in front of her requesting for donation of 6 yuan for bus fare. I was like, what?! Did she really need to beg for money for a ride home? I could not believe my eyes when Jam's kind-hearted friend actually gave her 6 yuan but guess what? After taking the money, she continued to squat there! Now if that's not a scam, I don't know what is! Anyway, we boarded our bus and arrived at Daxu about an hour later. 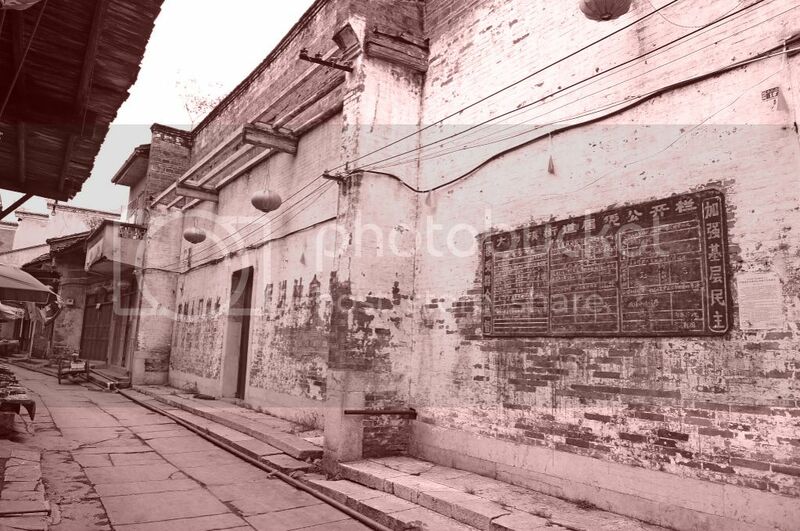 We were dropped off at Daxu new town area and had to walk about 5 minutes to reach the ancient town. It was quite a sight to see ancient buildings with their unique architectural designs lining up both side of the street. 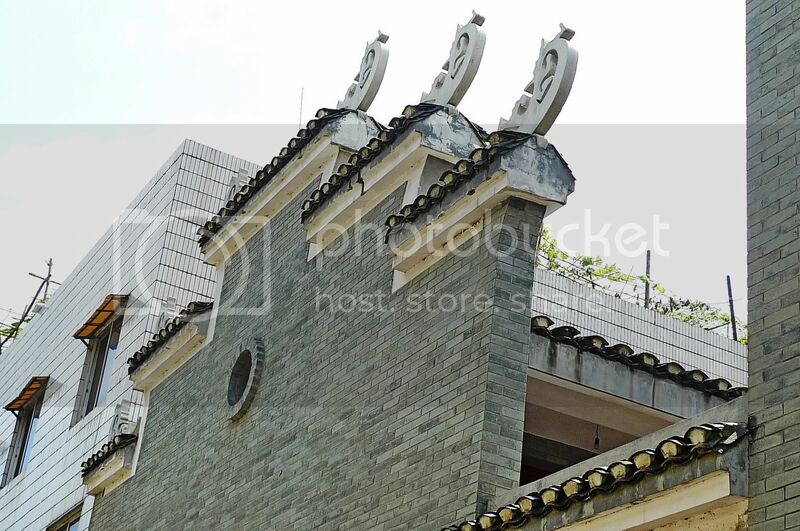 Look at these unique carvings at the rooftop! I was thrilled to see them! 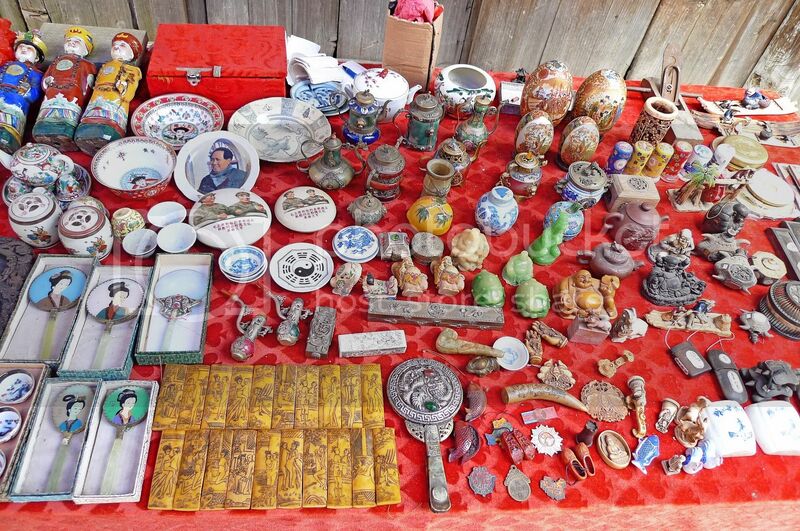 There were also many stalls selling handicrafts, food and souvenirs. I did not buy anything here. 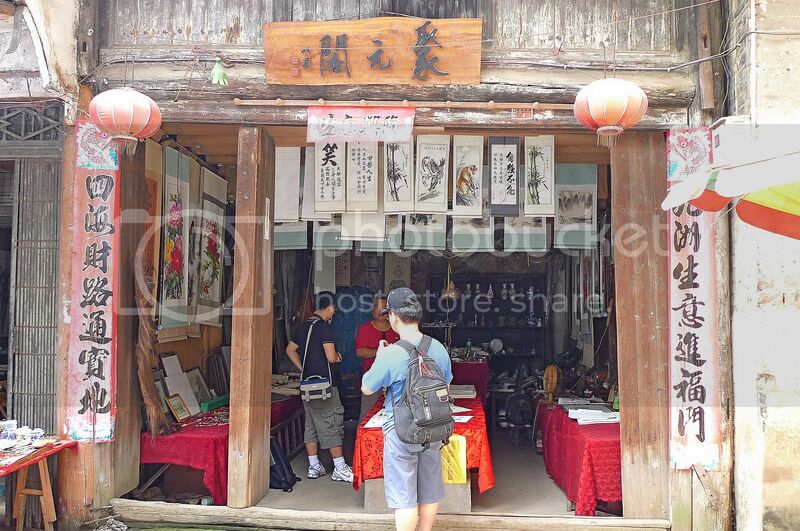 Except for some beautiful Chinese paintings from this shop! This is one of the paintings I bought for 10 yuan straight from the artist himself! Nice? If not mistaken, I have passed this painting to one of the winners of a contest I organized last year! Now what did they have here? 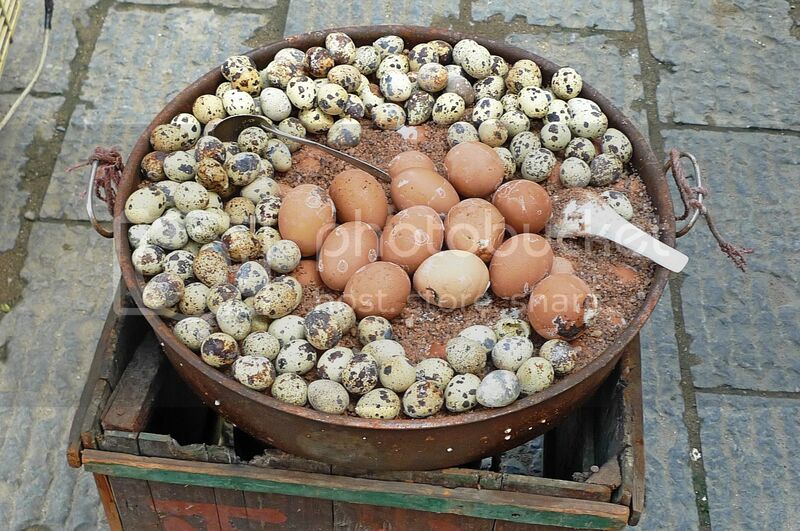 Chicken eggs and quail eggs? No I did not buy any of those eggs! Haha! There is a temple in this ancient town called Longevity Temple. 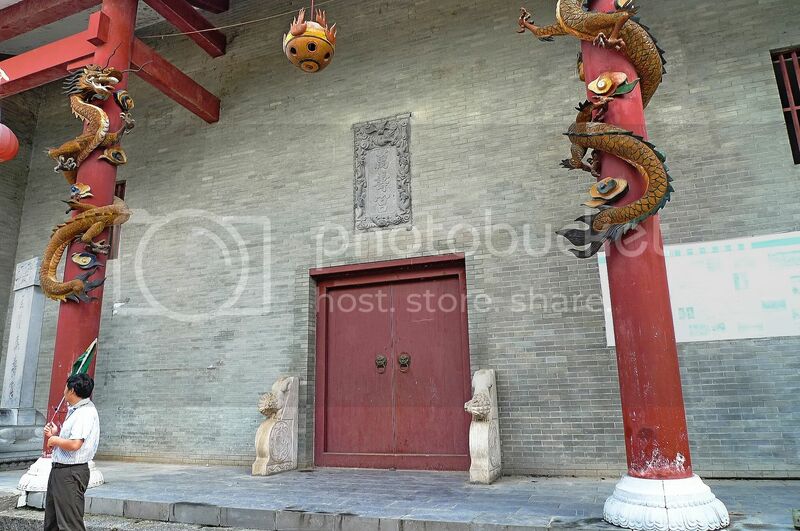 Can you see the dragon carvings on the two red pillars? Oops! Could not really capture the whole dragon on the right pillar! While we were there, a group of Japanese tourists were also there admiring the temple! Hmmm, these ancient buildings look better in sepia right? See the strange looking vehicle below? I don't even know what you call it! They like to hang red lanterns outside the buildings. 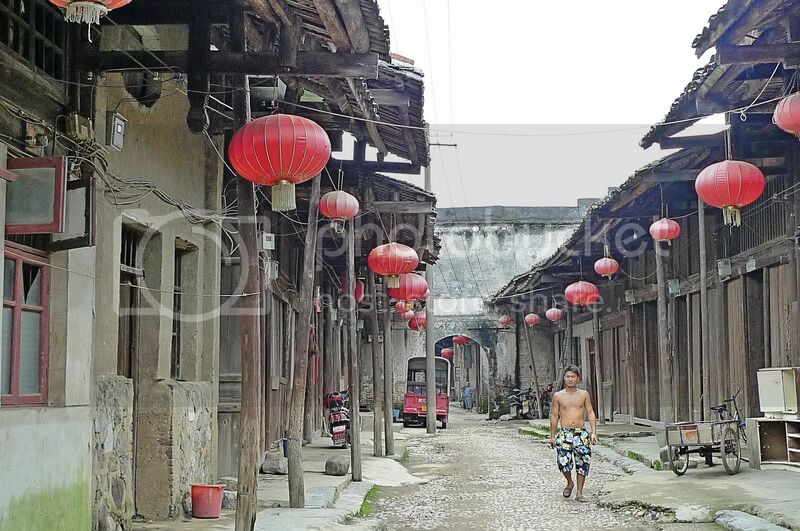 Rows and rows of red lanterns lining the street outside each house. Coming up in Part 2 : Stepping on the famous Longevity Bridge and How I was scolded by an old lady! now back to Guilin? :D abt that young lady, hmm that must be a scam! Nice picture here. I agree with Marzie that must have been a scammer. nice and cheap painting!!!!!!! but why guilin again??? Do you roll it and keep in a long cylinder tube? Yeah! Thank goodness huh! Some of them just wanna bring you to other places so that they can earn money. Aiyoh....buat malu only. She is well dressed...but then no money? Must be a scam. This happens everywhere. What a shame! Hmm...there are crafts made from ivory right? :D Everything looks kinda exquisite...but...well...better not waste money right? Har? That is how they cook eggs? An d then they expect us to eat right away? :p Yerr...not so hygiene right? 2 dragons trying to get the dragon ball right? It looks quite old. :D I mean both of the dragons look faded. Indeed bro. Sephia really give the pictures more depth and details. :D Look very pro o.
I thought you were writing on Cambodia. Suddenly you bring us back to China! 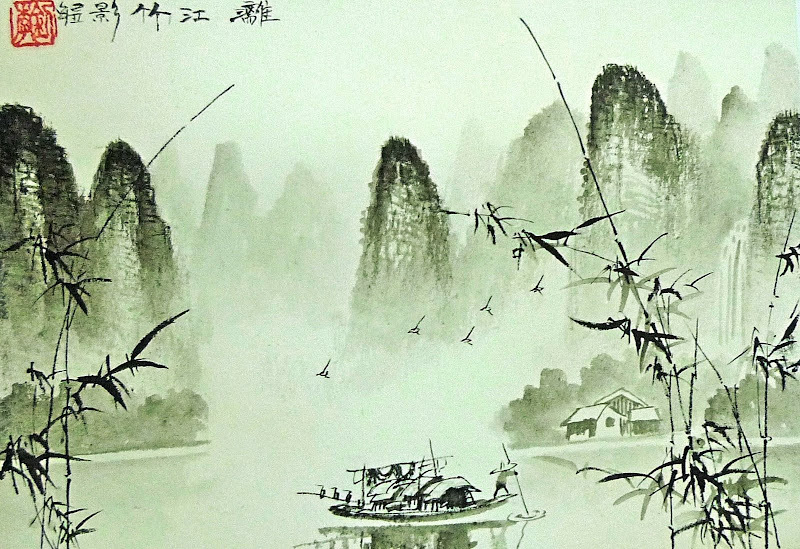 If not mistaken Bananaz saw this too, a lovely authentic art piece from the artist himself all the way from the ancient town of Daxu in Guilin..looks very very familiar huh.. The last pix would be a good place for those swordsman or kungfu movie nice row of lanterns..
love the handicrafts n the paintings! the girl is obviously a beggar lah! I think there is half develop fetus inside the egg. Enjoy your Weekend Mr. Panda! This town looks so calm and nice. The painting is very pretty! Olla.. eh! when was all these? I like the red lanterns. They bring out the colours of the place and make the place looks more lively. Owh! you were being scolded by an old lady? Sounds interesting (not on the part you were being scolded but more of wanting to know why?" hey, nice to go backpacking with you, foong.. u can really go into so many places..
monica, haha yes must finish all my China posts before proceeding to Cambodia posts! Yes, it's a scam alrite! bill, thanks! Yes it's a scam most definitely! caroline, yeah gotta finish all my Guilin posts first! I didn't buy anything there cos I was thinking of buying souvenirs at the Guilin Night Market instead. che-cheh, actually the painting is not very large. The artist just wrapped it in newspaper for me and I placed it nicely in my travel luggage back at the hotel. tekkaus, haha everyone is asking me the same question so yes, I have to finish all my China posts first before blogging about my Cambodia trip. Yes, I love that painting too! That's why I bought it! Yeah, the temple looked old. It's after all in Daxu Ancient Town. bananaz, haha! Are you the one who won the painting from me? ken, she's more like a conwoman than a beggar.Haha! incik restnrileks, this was last year around July/August. Can you believe I took one year to blog about this? Haha! Sigh! Those people cheating people's money. My dad met this one arm little boy (about 10 y.o) when he traveled to Thailand years ago. He was there begging for money. Pity him, dad gave him some money and later he saw this boy at a corner counting his money with both arms ! He hid one of his arm inside his giant T shirt. Hmm...got scolded....poor you but am interested to know what happen. OMGoodness! You're only at day 2. LOL! The place looks neat and clean even though ancient. That must have been a big temple with high ceiling too. No visitor allowed inside(?) as there's no picture. 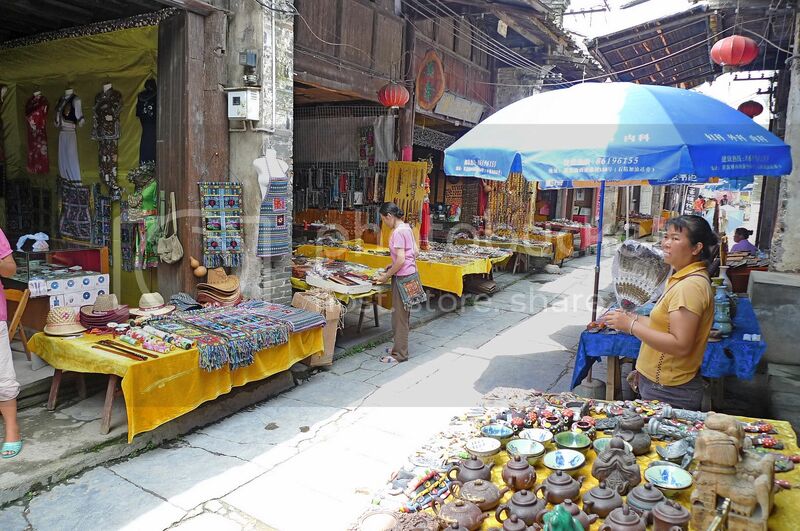 That souvenir row sure looks interesting - great for browsing and trinket-picking. It's great to be able to buy a piece of art from the artist himself. I was told that paintings from a pile are sometimes from some (children) art schools where pupils churn out the pieces (for sale). Btw, injecting your recent travels with China posts seems like a great idea. That way, we get new contents (sort of) and you get to finish your old travels. Two birds, eh? Thanks for sharing, Foong. Great effort. Happy Monday! 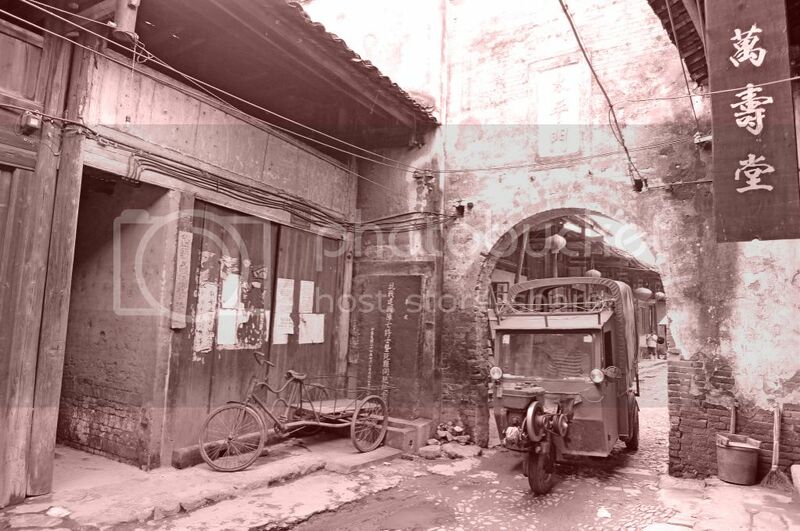 it's ilke walking back in time through those alleys. the sepia effect makes it feel even more ancient. When i was in some outskirt part of China (couldn't remember where) william n i were about to board a bus when he was pulled down by a beggar, a disable beggar. pulled and tugged and refused to let go until william gave him some coins.. gosh! scary i tell u! beggars are everywhere there..
mNhL, ooh your dad got conned by the little boy? Yeah, cheaters are everywhere! We did not go into the temple. I think it was locked or something. merryn, how unfortunate! Haha! But I didn't really encounter any beggars in Guilin. 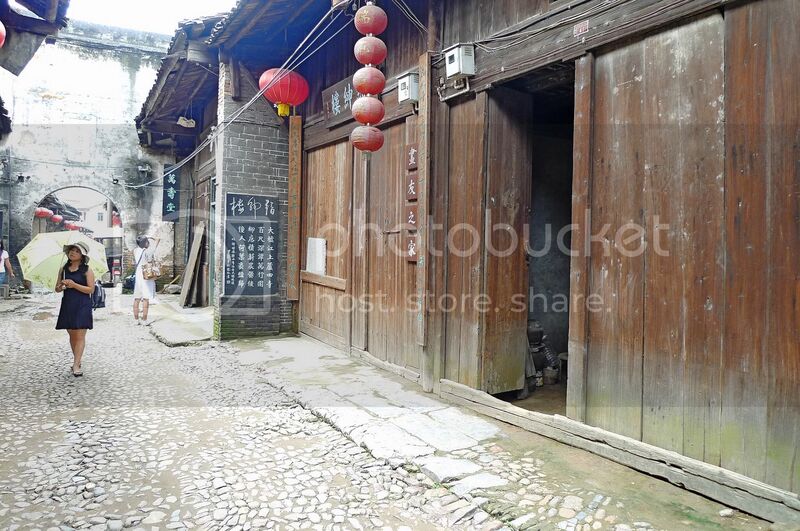 iriene, this Wu Zhen village is in Shanghai? I have not visited Shanghai before! Thanks for the post. 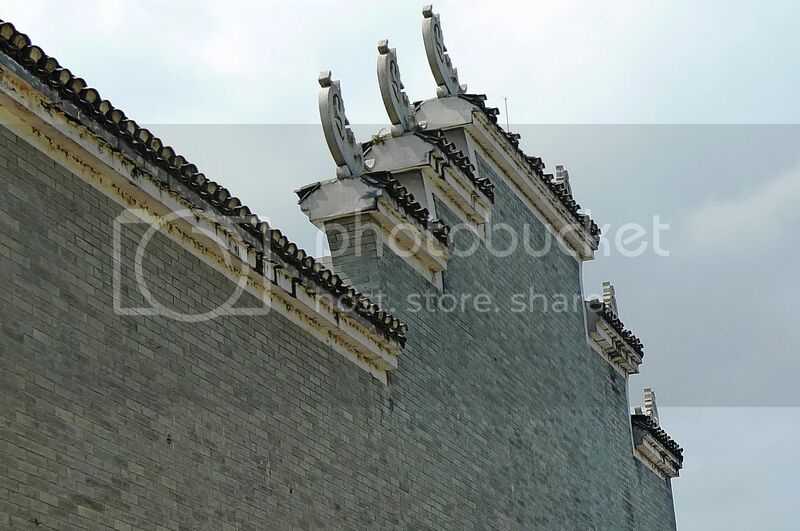 The photos are really very nice specially the Longevity temple and the dragon carvings on them They are quite unique. anyway, i like that painting, and also that two photos you made with retro feel.. nice..